Was P.T. Barnum right? Is there a sucker born every minute? The global warming crowd certainly hopes there is! This is where the sucker part comes in – the only proof Keating offers for this outlandish claim is a report sent to the United Nations from Kiribati’s former president without scientific documentation demanding money from the rest of us to save these islands. Can’t blame him – didn’t Obama promise to give all of America’s money away? Guess he must have he must have missed the news that there is a new sheriff in town. In order to keep this global warming scam alive, a bunch of journalists, and I use that term loosely, headed to the Island to document it sinking into the Pacific. What they found were inhabitants denying the islands were sinking. One journalist chalked it up to a “mental block” that makes the locals blind to the truth. There is blindness alright but it certainly isn’t on the part of the inhabitants. Despite the widely help perception of the global warming crowd that reef islands around the perimeter of coral atolls are eroding and will disappear as a consequence of sea level rise, the total area of reef islands has increased over recent decades. The study determined that the vast majority of this increase was from human activities. For example, people filling in marine areas with materials from nearby beaches and shore areas to create new land. Yet, even in rural areas where natural processes dominate, the study found that “most reef islands show stability” and have had “modest natural rates” of growth proving that the only mental block resides with the global warming scammers. Real data from tide gauges does show that the average global sea level has been generally rising since 1860 or earlier. Instruments on satellites since 1993 have also shown a rise in the average global sea level. Of course that doesn’t really mean the sea level has risen everywhere. The ocean’s waters are not evenly distributed like they are in small bodies of water. The sea level in the Indian Ocean is about 330 feet below the worldwide average, while the sea level in Ireland is about 200 feet above average. And it wouldn’t even matter if all the oceans were connect – variations in sea level are caused by gravity, winds and current – not global warming. As an example, between 1991 and 2010, the sea level rose by around 6 inches in the tropical Western Pacific while falling by the same amount in San Francisco, which is an area that should be swamped, if for no other reason than to clean it up. Long before humans began using fossil fuels, the earth and its climate changed. Every area of the continent has at one time or another been covered by water and there is “real” evidence that some areas have been submerged at least 20 separate times. It is a mistake to assume that a rise in the average global sea level translates to a net loss in coastal land. Per a 2016 study published in the journal Nature, the earth gained a net total of 5,000 square miles of coastal land area from 1985 to 2015. ← America Plumbing the Depths of Satan? Greed is not the right word, it’s more like a toxic mindset. Part of this disfunction could be described as arrogance, deceit and resentment. You can see this directly played out on California’s nuclear power. Michael Shellenberger describes in detail how certain members of the left took California’s nuclear power down. Not all the environmental left was for this by the way. Jerry Brown, the current Governor of California, was part of this and has closed some more nuclear power plants. 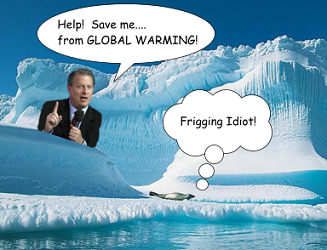 The legacy of the arrogant, deceitful and resentful 1960’s-70’s environmentalist is still being played out. Ironically California’s carbon output is jacked up significantly as a result. The common fake riskless virtue signaling. Capitalist in profits socialist on downside risk. The Bob Rubin trade, one of the reasons Bitcoin was created. It was to combat this corruption of risk & money. Nassim Nicholas Taleb and Naval Ravikant chat at Blockcon 2018 in Santa Monica a couple days ago. It starts out slow but covers many of our current political and social misalignments.